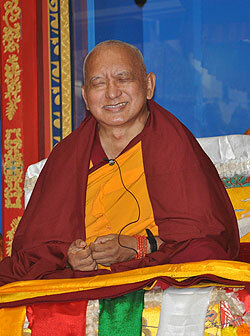 Lama Zopa Rinpoche talking about Lama Yeshe, Root Institute, India, March 2014. An Invitation to Participate in CPMT 2014! “Practicing patience doesn’t mean that if someone asks you to immediately kill a gigantic lady, the size of Mount Meru or the size of a louse, you do everything that the person asks. It is not like that! What it means is that in your heart you feel or think that this person is the most kind, the most precious, the most dear one. This is what guru Buddha has taught – you need to practice patience with somebody, because the person who is called ‘enemy,’ the one who has anger towards you, then if you practice patience towards that person and don’t get angry back, then that person gives you the most precious thing, enlightenment, the state of omniscient mind. With that person you can bring the numberless sentient beings to enlightenment, free them from the oceans of samsaric sufferings and bring them to full enlightenment. So this becomes the reason to practice patience. 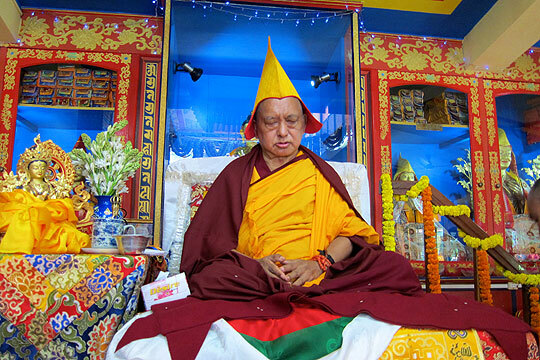 Lama Zopa Rinpoche during the long life puja offered by Dagri Rinpoche and Root Institute, India, March 2014. A new short video of Rinpoche offering music is up on FPMT’s YouTube page. 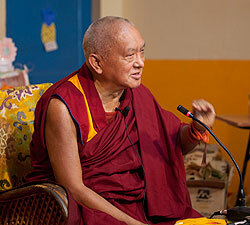 Find more video of Lama Zopa Rinpoche. The April-June 2014 issue of Mandala magazine has just been published, and it’s full of amazing stories and photos! We share news on the Maitreya Projects in Kushinagar and Bodhgaya and an update on the Great Stupa of Universal Compassion in Australia, which is hosting the September 2014 Council for the Preservation of the Mahayana Tradition (CPMT) meeting. We celebrate the 40th anniversary of the International Mahayana Institute and much more. If you aren’t already receiving Mandala, sign up now to become a Friend of FPMT at the Foundation Friend level or higher. In addition to receiving Mandala in print, you will also receive the PDFs of the issues as soon as they are published! For more, visit us online. Lama Zopa Rinpoche doing prayers in front of the 24-foot [7-meter] Maitreya statue on the Maitreya Project Bodhgaya land in India, February 2014. Read Rinpoche’s recent letter about Maitreya Projects. March 31 is the last day for sending in your International Merit Box Project donations to be used for this year’s Merit Box grants. Your participation provides much-needed financial support to Dharma projects and initiatives that fulfill the mission of FPMT all over the world. Click here for ways to make your donations. Program News: FPMT Education Services and Vajrapani Institute have been in collaboration on a new meditation-focused retreat program. This program was born as a result of Lama Zopa Rinpoche’s expressed wish for FPMT students to actualize the lam-rim, especially to attain shiné (calm abiding) and bodhichitta. In order to fulfill that wish, the “Developing a Focused Mind” retreat series has been created. You can learn more about these retreats on Vajrapani’s website. REMINDER: All online materials are available for free by becoming a Friend of FPMT at the Dharma Supporter level or higher. Alternatively, all online modules are available individually via The Foundation Store. Land of Medicine Buddha, California, USA has finished three impressive prayer wheels. Together they contain over 240 billion mantras as well as many sets of texts. Photo courtesy of Land of Medicine Buddha. One of Lama Zopa Rinpoche’s vast visions for FPMT is to build 100,000 prayer wheels with a minimum height of 6 feet [2 meters] around the world, with some wheels placed in the ocean. The Prayer Wheel Fund was established to provide the resources needed for this aim. We have created a special page devoted to chronicling all of the prayer wheels being built around the world. 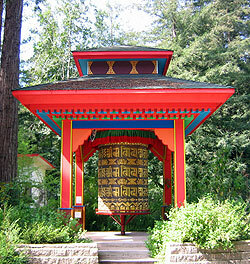 To date, approximately 12 large prayer wheels and many small ones have been built. Just 99,988 left to go! Please rejoice! NOTE: If you or your center has built a prayer wheel inspired by Lama Zopa Rinpoche and we have not documented it on our page, please let us know! Please enjoy this latest card designed by Lama Zopa Rinpoche: Buddha’s Teachings on Our Lives Card. FPMT centers, projects, services and study groups get a 40% discount on all of Lama Zopa Rinpoche’s cards. Click here for more. Lama Zopa Rinpoche visiting Maitreya School and Tara Children’s Project at Root Institute, India, March 2014. Would you like to hear Lama Zopa Rinpoche share his vision for students and the organization? Do you have ideas and questions you would like to discuss with FPMT directors, spiritual program coordinators, board members, teachers and coordinators? Would you like to re-connect with your international FPMT family? If so, please come to FPMT’s international meeting – CPMT 2014: Preserving the Dharma Now and into the Future – September 13-19, 2014 at the Great Stupa of Universal Compassion, Bendigo, Australia. 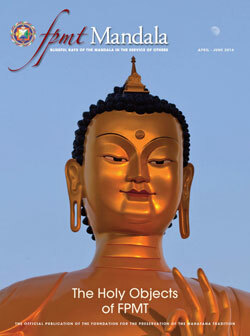 More information, including the agenda and who can participate, is available on fpmt.org. Buddha Amitabha Pure Land, USA is looking for a project manager; Maitreya School, India (a project of Root Institute) needs volunteer teachers.